By B. R. Myers. Busan: Sthele Press, August 2015. 289 pp. Analysts often invoke North Korea’s Juche ideology of “self-reliance” to explain everything from the country’s personality cult to its military belligerence. Some portray Juche as a logical result of North Korea’s geopolitical environment, and of the Korean peninsula’s history of invasion and subjugation by neighboring countries. When it comes to many of the questions raised about North Korea’s conduct, outsiders often will refer to Juche as part of the answer. The “myth” of Juche’s role throughout North Korean history is the target of B. R. Myers’s latest book, which asserts that conventional assumptions about the philosophy’s significance are plain wrong. As in his 2010 book, The Cleanest Race, Myers seeks in North Korea’s Juche Myth to challenge fundamental assumptions about the DPRK. He argues that Juche was created primarily for the outside world, and that it has never served as a guiding ideology for the North Korean regime. By promoting what appeared to be a homegrown ideology, the DPRK sought legitimacy both in the West and in South Korea. Meanwhile, Kim Il Sung’s personality cult benefited from claims that the leader had crafted his own ruling philosophy. According to Myers, the regime never intended Juche to guide its own decision-making. The author quotes extensively from the Juche canon to argue that the doctrine lacks sufficient depth to guide North Korean leaders. Myers argues that observers who assume Juche to be of profound intellectual subtlety have not read the key texts in full. For example, what is the real meaning of the foundational Juche expression, “man is the master of everything and decides everything?” Meyers quotes a former South Korean dissident as believing many Juche texts are the intellectual equivalent of asserting, “If you raise a lot of chickens, you will get a lot of eggs.” However, North Korean texts require a great deal of contextualization to appear logical, and Myers frames these attempts at interpretation as part of the problem. For instance, while analysts often interpret Kim Il Sung’s supposed first mention of Juche in a 1955 speech as an attempt to signal North Korea’s independence from the Soviet Union, Myers shows that Kim’s address ardently emphasized the strength of the Soviet-North Korean friendship. Juche, on the other hand, was only mentioned relatively briefly. North Korea’s Juche Myth is not without problems, but Myers’s latest offering provides an important piece of scholarship. The author’s fervent criticism of the North Korean regime will come as no surprise to anyone familiar with his previous writings, but by taking its ideas seriously, he approaches the DPRK’s leadership with far more respect than many other scholars. Myers treats the regime as an actor with its own volition rather than a victim of historical circumstances, and he regards Juche as a consciously crafted concept rather than an ideology that evolved beyond deliberate human control. The North Korean regime holds true historical agency in the author’s view; it did not assume its current form in mere reaction to Western-imposed circumstances. This approach marks a welcome step away from treatments of North Korean history as linear and inevitable. Myers firmly opposes defining the North Korean state along the lines of Adrian Buzo’s “guerilla state.” While such models often seem to accurately describe North Korea, they too often trace the country’s current character to events that occurred decades ago—as if the regime made no conscious decisions along the way. Myers shows that North Korea’s history is, in truth, a result of concrete choices that have rarely followed a linear historical pattern. Myers makes another important contribution by comparing Juche to other communist thought systems that emerged in the early to mid-twentieth century. He shows that, contrary to popular belief, Juche does not have to be read as a diversion from Marxist-Leninist doctrine. Kim Il Sung and Stalin both argued against dogmatically applying communist doctrine in the same way in all countries. North Korea shared its nationalist rhetoric with countries like Romania, meaning that its emphasis on autonomy was not unique in the communist world. This comparison ultimately reveals Juche to be far less mysterious and special than it may appear to contemporary observers. Myers argues that the philosophy was actually well in line with what North Korea’s international benefactors prescribed. The merits of this argument are open to debate, but the author takes a vital step of trying to strip Juche of its mystery and exoticism. 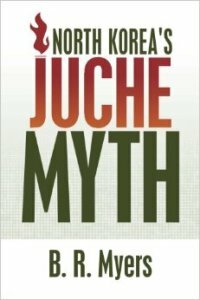 While some may claim that Juche is too opaque and “too Korean” to be fully understood by Westerners, Myers shows that its basic tenets are neither unique nor uncommon among communist countries. Myers deserves immense credit for surveying a vast amount of primary source material. Few other works of North Korean history and politics rest on such a broad source base as North Korea’s Juche Myth, with its bibliography of over fourteen pages of original North Korean sources. However, the author would have been well served by more extensively developing his argument about the differences in types of North Korean propaganda material. While Myers theorizes about the different purposes of North Korea’s various publications, the reader is left wishing for a more extensive explanation. He specifies three “tracks” of North Korean propaganda: 1) an inner track of texts meant solely for North Koreans; 2) an outer track of domestically targeted propaganda written with an understanding that foreigners may also see it; and 3) an export track of propaganda meant for outsiders. His book rests on the premise that the regime rarely invokes Juche in messages to its own people, but brings it up regularly in communications with foreign audiences, and it is therefore critical to ascertain the intended audience of the government’s various messages. However, Myers does not fully explore how he distinguishes “inner track” from “outer track” sources. He appears to treat Kulloja magazine and Rodong Sinmun, for example, as though they are intended purely for North Koreans, but are readers to believe that the regime has never known that foreigners can acquire these publications? One only needs to go through the five-minute registration process at the Library of Congress in Washington, DC, to access a nearly complete collection of Kulloja issues dating back to the mid-1940s or hop online to read through the latest updates to Rodong Sinmun. The book’s argument also would have benefited from further discussion of the differences between the propaganda types it surveys. Myers could have engaged and debated available literature on this topic: Sonia Ryang, for example, discusses extensively the different purposes of various publication types in North Korea in her 2012 book, Reading North Korea. His claim that speeches and works by North Korea’s leaders are not important in the propaganda is also questionable. The leader’s biographies may be most central works in North Korean propaganda, but the speeches and works of the leadership still fill important functions. For example, publications such as academic journals regularly use them as a frame of reference, similar to how Soviet propagandists used writings by Lenin and Stalin to anchor their own writings in an acceptable tradition. Myers also approaches his source materials with a degree of inconsistency. For instance, he writes off some documents as relatively unimportant, including the writings and teachings of Kim Il Sung. He suggests that how Kim lived his life was more important than what he wrote or said. Meanwhile, he accepts at face value a number of statements by Stalin and others that encourage nationalism and the creative adaptation of Marxism-Leninism to national conditions. The book’s argument would have been strengthened by more elaboration on the different purposes of the materials that he surveys, and the differing nature of rhetoric versus policy in general. Readers are expected to believe that Soviet policy truly encouraged nationalist diversions from Marxist-Leninist doctrine simply because that was the message of Moscow’s propaganda. But how did the Soviet Union’s stated position on this matter compare to its practices? The issue of ideology versus reality is complicated, and Myers does not quite do it justice. For example, certain archival materials from the 1940s hint at Soviet concern that North Korean communists were copying Soviet concepts without due thought, while other documents suggest that the Soviets were troubled by a lack of orthodoxy among North Korean communists on issues like land reform. Finally, Myers writes in quite an engaging style, but he sometimes appears intent on creating conflict even where it is not necessary. He swiftly declares significant pieces of North Korea scholarship like Beyond Charismatic Politics to be at fault for buying into the “Juche myth.” Charles Armstrong’s Tyranny of the Weak takes the most flack. But neither book really paints Juche as the be-all and end-all of North Korean history. He also criticizes the New York Times’s Choe Sang-hun—one of the more knowledgeable English-language journalists writing on Korean affairs—as someone who is “anti-anti-Pyongyang,” without providing examples to back up his claim. Still, Myers’s contributions are far greater than his weaknesses in what is, overall, an important book. He urges readers to see that the Juche emperor is naked, and to question longtime assumptions on basic matters like periodization and interpretation. For those interested in studying North Korea, this book provides an intriguing and important exploration of the purpose and use of Juche. Myers sets up a longer narrative example on the first page of the introduction. See B. R. Myers, North Korea’s Juche Myth, 1st ed. (Busan, South Korea: Sthele Press 2015). B. R. Myers, The Cleanest Race: How North Koreans See Themselves and Why it Matters, (Brooklyn, NY: Melville House, 2010). Myers, North Korea’s Juche Myth. 4–5. Adrian Buzo, The Guerilla Dynasty: Politics and Leadership in North Korea (Boulder, CO: Westview Press, 1999). Myers levels an amount of unfair criticism toward Buzo, who can scarcely be accused of painting a romantic picture of the North Korean regime. For an example, see Hongkoo Han, “Colonial Origins of Juche: The Minsaengdan Incident of the 1930s and the Birth of the North Korea-China Relationship,” in Origins of North Korea’s Juche: Colonialism, War, and Development, edited by Jae-Jung Suh (Lanham, MD: Rowman & Littlefield Publishers, 2013), 33–63. As the British historian Mark Mazower has pointed out, Moscow was greatly perturbed by international communists who were too eager to situate themselves as mere followers of Soviet communism rather than builders of their own nations. See Mark Mazower, Dark Continent: Europe’s Twentieth Century (New York: Random House, 1998), 254–255. Han, Origins of North Korea’s Juche, 32. Myers, North Korea’s Juche Myth, 9. Sonia Ryang, Reading North Korea: An Ethnological Inquiry (Cambridge, MA: Harvard University Asia Center, 2012). One such journal is Kungje Yungoo. For a discussion on the editorial voice of Stalin and Lenin, see Alexei Yurchak, Everything Was Forever, Until It Was No More: the Last Soviet Generation (Princenton, NJ: Princeton University Press, 2006). Myers, North Korea’s Juche Myth, 134. Heonik Kwon and Byung-ho Chung, North Korea: Beyond Charismatic Politics (Lanham, MD: Rowman & Littlefield Publishers, 2012). Charles K. Armstrong, Tyranny of the Weak: North Korea and the World, 1950-1992 (Ithaca and London: Cornell University Press, 2013). Myers, North Korea’s Juche Myth, 211.